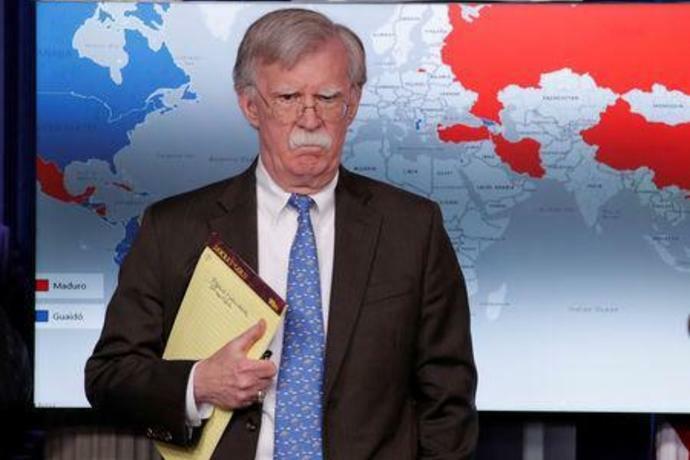 WASHINGTON (Reuters) - White House national security adviser John Bolton raised questions about the United States' intentions in Venezuela after he appeared at a briefing on Monday with a notepad containing the words "5,000 troops to Colombia," which neighbors Venezuela. It was not immediately clear what Bolton's notes meant and whether President Donald Trump's administration was seriously considering sending U.S. troops to Colombia. It was also not clear if disclosure of the notes was intentional, and there was no indication that such a military option would be used any time soon. 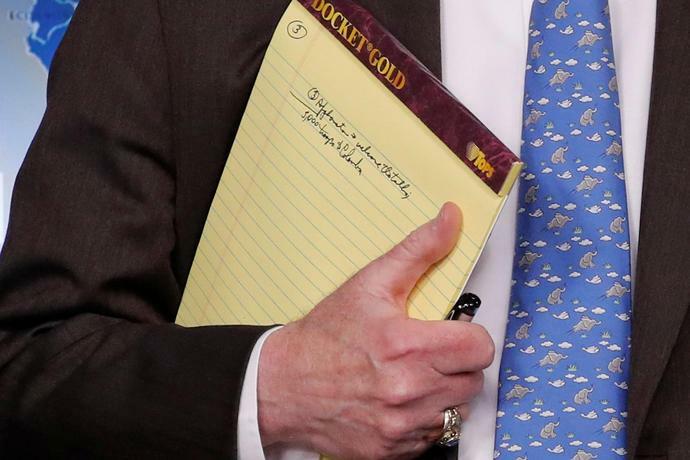 Asked about a photograph depicting the notes, a White House spokesman said on Monday: "As the President has said, all options are on the table." Pentagon spokesman Colonel Rob Manning said the number of U.S. military personnel in Colombia remained unchanged as part of a pre-existing partnership. A U.S. official, who asked not to be named, said they "have seen nothing to support" Bolton's annotation. Colombia's Foreign Minister Carlos Holmes Trujillo, in a statement late on Monday, said: "We are not aware of the significance or the reason" for Bolton's notes. Colombia has coordinated its policy on Venezuela with the rest of the Lima Group of South and Central American nations and would keep doing so, he added. Bolton held the notepad at a news briefing with reporters to unveil sweeping sanctions on Venezuelan state-owned oil firm PDVSA, Washington's latest step to pressure Caracas' socialist President Nicolas Maduro to leave office. Sending U.S. military troops to Colombia would escalate tensions with Venezuela, even as its opposition leader Juan Guaido has said a peaceful transition https://reut.rs/2RXasMo of power is possible. Guaido, who proclaimed himself interim president of Venezuela last week with U.S. backing, told a German broadcaster on Tuesday that he was the country's only legitimate leader https://reut.rs/2GdLXUv. Separately, he told CNN in an interview aired on Tuesday: "We must use great pressure for a dictator to leave, install a transitional government and have free elections."